Strike Now to Defend ILWU Union Gains! The message pushed by the bosses’ Pacific Maritime Association (PMA) is plain enough: the “war on terror” is good for profits, a strike is not good for “national security” (that is, profits). 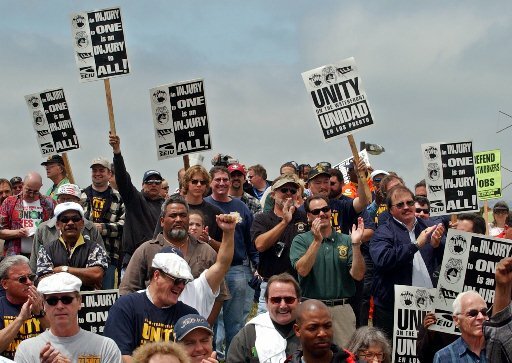 The threat is clear: strikers will be branded as “terrorists.” The response of the union tops has been to issue a gag order, keeping the membership in the dark about the negotiations and threatening sanctions against Local 10 business agent Jack Heyman for revealing and denouncing Ridge’s threatening call. Meanwhile, the ILWU misleaders disavow any talk of a strike or even a work-to-rule job action. 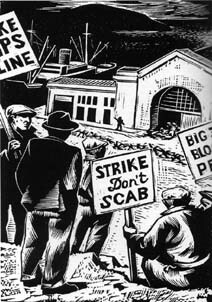 ILWU militants must say: The hell with that – strike to win! As the PMA declares the negotiations a “watershed” for labor, it is necessary mobilize union power in a joint transport/waterfront strike. Against threats to call out the National Guard, we say: bring out the Teamsters, the railroad unions and the International Longshoremen’s Association (ILA) on the East and Gulf Coasts to shut down U.S. ports as tight as drum. There should be solidarity walkouts in ports around the world. The longshore contract expired July 1st. But rather than “No contract, no work,” the union tops are saying, “No contract, so what?” They’re keeping the docks running as they extend the previous contract day by day. Union spokesman Steve Stallone told the Journal of Commerce (1 July) that a strike authorization vote has not even been held, there are no plans at this time to hold one, and “we haven’t even designed the ballot.” This can only embolden the PMA, which is hard-lining its demands. Backed up by a coalition of corporate giants like Wal-Mart and Nike, the employers’ group has threatened a lockout in the event of labor slowdowns. Meanwhile, industry analysts predict that a walkout would be met with federal strikebreaking using the Taft-Hartley slave-labor law. West Coast ports are expected to double the amount of cargo they handle over the next decade – but the maritime bosses want this work to be done by less longshoremen. They seek to update and push to the limit the job-slashing trend enshrined four decades ago in the “Modernization and Mechanization” (M&M) agreement worked out by longtime ILWU leader Harry Bridges. This new phase would place computers in cargo-moving equipment and scanners at the terminal gate. This attempt to impose speed-up, eliminate jobs and slash costs (including for medical coverage in this accident-rife industry) in the name of technological modernization must be fought with demands for a six-hour day at no loss in pay, which would require the addition of another shift of longshore workers. Meanwhile, the bosses are about to impose government blacklisting in the form of a draconian “Maritime Security Act.” This McCarthyite legislation, cosponsored by Democrats and Republicans, would gut the union hiring hall, fire militants and militarize the waterfront. This is the culmination of the anti-labor crusade that has brought union-busting to the docks from Australia to Liverpool over the last decade. In 1997, the PMA attempted to railroad Oakland longshoremen who, in solidarity with the Liverpool dockers, refused to work the Neptune Jade after it was loaded by union-busters (see “McCarthyite Witchhunt Against Bay Area Labor Activists,” The Internationalist No. 4 [January-February 1998]). Earlier this year, employers and Confederate flag-waving state officials in South Carolina were defeated in their attempt to railroad Charleston ILA longshoremen to prison in a racist, union-busting frame-up (see “Defend the Charleston Five! Key Battle for Labor Rights and Black Freedom!” The Internationalist No. 10, June 2001). Smarting from this setback and using the imperialist “war on terrorism” as a ruse, the maritime bosses are out for blood. But they can be stopped. The raw power of the longshore unions has the capitalists worried. The New York Times (21 June) published a major article (“Fear for Jobs Could Bring Shutdown of West Coast Ports”) reporting that a three-week strike would cost the U.S. economy almost $50 billion. Fear of a dock strike is being cited as a major reason for the current stock market jitters on Wall Street. The bourgeoisie has good reason to be nervous. The ILWU has historically been one of the most left-wing unions in the country. In April 1999, longshoremen shut down all West Coast docks for ten hours to demand freedom for Mumia Abu-Jamal (see “ILWU West Coast Port Shutdown Showed Labor’s Power in Fight to Free Mumia,” The Internationalist No. 8 [June 2000]). Dock workers know how to use their power: the key obstacle is the pro-capitalist union bureaucracy that hamstrings their militancy and chains them to the bosses parties. Today, the shipping bosses yell that “workplace disruptions” would interfere with “the nation’s defense efforts” (PMA statement, 11 March). The capitalist rulers of the United States see the Pacific Rim as increasingly important to the economic and military/strategic running of their empire. Pacific trade means mega-profits, and overthrowing “Red China” – which U.S. imperialism “lost” in the 1949 revolution that established a bureaucratically deformed workers state – is high on their global agenda. The drive for more labor “efficiency” (exploitation) also reflects competition with imperialist rivals, some of which have introduced wide-ranging computerization and robotization of their ports. The attack on longshore labor is inseparable from these broad political issues; defeating it requires intransigent opposition to the imperialist rulers and a fight to mobilize labor’s power on an international scale. The answer to the global capitalist offensive against labor is not the protectionism (open or disguised) and defense of national sovereignty pushed by the “anti-globalization” movement – which at most seeks to “reform” capitalism – but a fight for world socialist revolution. As the ILWU tops bow to national-unity “jawboning” from Tom Ridge, reportedly joined by war secretary Rumsfeld, dock workers are under the gun. Imperialist war abroad has heightened attacks on labor, minorities and democratic rights “at home.” With the drive for police-state repression embodied in the “USA Patriot Act,” last December the U.S. Senate unanimously passed the “Port and Maritime Security Act of 2001” (S. 1214). A similar bill has been passed by the House of Representatives and they only need to be harmonized before being enacted and signed by Bush. While several dozen Democratic Senators and Congressmen led by Ted Kennedy recently issued a statement against White House interference in the ILWU talks, the Maritime Security Act is a brainchild of the Democratic Party. This union-busting legislation exposes one again the lie pushed by the labor tops that these capitalist politicians are some kind of “friends of labor.” The Democratic Policy Committee’s Web site includes S. 1214 in a list of “Senate Achievements Under Democratic Leadership,” together with the USA Patriot Act, approval of $8.3 billion for “homeland defense,” and the approval of the Afghanistan war. Indeed, the Maritime Security Act stems from a seaport policy review ordered by the Clinton administration. A first version of the bill passed the Senate in August 2001 as an “anti-crime” measure. After the September 11 indiscriminate attack on the World Trade Center, the capitalist rulers used the patriotic war frenzy to repackage and give a new justification to their plans to militarize the docks. The Act is a high-caliber weapon in the hands of the bosses, aimed at union militants and sectors of the working class which are the favored targets for racist repression. Declaring U.S. ports “particularly vulnerable” to “illegal alien smuggling,” drugs and contraband, it calls for screening and background checks to eliminate workers who have been convicted within the past seven years, or released from prison within the past five, for a list of 16 offenses including “willful destruction of property,” “a felony involving a threat,” drug felonies, “conspiracy” and “sedition.” It is no accident that the bill was introduced by South Carolina Democrat Fritz Hollings, as the Charleston Five longshoremen were accused precisely of threats, violence and conspiracy as they defended their union against an army of riot cops, armored cars, helicopters and police boats. And South Carolina attorney general Charles Condon compared the Five to the authors of the September 11 attack. These are many of the frame-up charges traditionally used against labor activists. The IWW syndicalists were routinely framed up on sedition charges. ILWU members remember that Australian-born union founder Bridges was for years the target of McCarthyite witchhunting as a supposedly seditious, undesirable alien (despite the fact that he was a self-proclaimed champion of class collaboration). As for the “war on drugs” – which put dock workers in the government’s crosshairs back in the Reagan years – this is a centerpiece of the racist war on black ghettos and Latin barrios in which huge numbers of youth, poor and working people have been incarcerated and disenfranchised. As if this weren’t enough, the Act also says a worker can be excluded if “the individual does not meet other criteria established” by Bush’s Secretary of Transportation, Democrat Norman Mineta. This is a blatant recipe for racial profiling and union-busting on the docks. They want to bring back the “fink book,” with the government instead of the union controlling hiring. Especially endangered are the port truckers who are hired by non-union contractors and are largely immigrants from Latin America, Asia and Arab countries. These truckers have repeatedly waged militant strikes and job actions, including for union recognition. Yet their struggle has been stabbed in the back by ILWU and Teamsters union bureaucrats, who not only would sell them down the river but seek to take their jobs. In a vicious attack, ILWU head Spinosa tried to turn the bosses’ “security” crusade against these workers, writing: “Why are hard-working, productive longshore workers being targeted for extensive security clearance when unknown truck drivers are being allowed free access to our work environment?” (Dispatcher, September 2001). This rank chauvinism fits right in with the union leadership’s constant social-patriotic appeals to protect “American workers” against “foreign” companies and competition. Yet the fact that “the workers have no fatherland,” as Karl Marx pointed out, is particularly clear in an international industry like shipping. The attack on immigrants is the cutting edge of the onslaught against all workers and against the most basic democratic rights. The ILWU grew strong in the first place by fighting favoritism and racist discrimination on the docks. The union hiring hall was particularly crucial in these fights. Yet the union leadership under Bridges eventually institutionalized a second-class category of “B-men” for workers who were deprived of many union rights, while “casuals” have none at all. What’s needed is a fight for full citizenship rights for all immigrants, unionizing the port truckers with full rights, making “B-men” and casuals full members with full rights, forging a single industrial union of waterfront and maritime workers, and mobilizing the power of all transport workers – like UPS Teamsters whose contract expires soon – in common struggle against the bosses’ attacks. In the face of new technology there must be a fight to shorten the workday with no loss in pay (a sliding scale of hours), to divide up the work among all hands in a fight against unemployment, while aggressively recruiting minorities and women through the union hiring hall. These basic measures are fundamentally counterposed to the program of class collaboration of the union tops, whose decades of support to the Democratic Party are bringing bitter fruits for longshoremen and the working class as a whole. A new, class-struggle leadership must be built in the fight to forge an internationalist, revolutionary workers party. Far from leading a struggle against the bosses’ flag-waving attack on all port workers, the ILWU tops figure if they salute vigorously enough a few crumbs will come their way. The Maritime Security Act calls for including “labor organizations” together with the “private sector,” “law enforcement” and federal, state and local governments in new Local Port Security Committees. Defense of longshoremen against the “security” witchhunt demands a categorical refusal by all union representatives to participate in these committees and a head-on fight against this anti-labor, racist attack. Yet when Local 10 brought a motion to the ILWU’s January Caucus to “Oppose the Port Security Act,” the International tops changed it to say “Improve” the Act! Current ILWU president Spinosa hails from San Pedro, and stands in the tradition of local bureaucrats there who refused to unload a Soviet ship in 1983 at the time Ronald Reagan and the South Korean government staged their Korean Air Lines Flight 007 provocation. (Historically, the ILWU refused to join Cold War anti-Soviet stunts like the 1980 boycott of grain shipments staged by the ILA.) Spinosa’s predecessor McWilliams authorized union protests such as the Liverpool solidarity boycott. But calling for “fair trade” lent the ILWU’s “progressive” image to the AFL-CIO’s demands for protectionism – including counterrevolutionary agitation against China – at the April 2000 Seattle protests against the World Trade Organization. Both wings of the ILWU bureaucracy have proven time and again that their fundamental loyalty lies with the American capitalists, not the world’s workers. Against the flag-waving bureaucrats, longshore workers should take inspiration from the tradition of longshoremen who fought for revolutionary working-class internationalism in October 1919. Shortly after a general strike shut Seattle down for five days, that city’s longshoremen discovered that crates marked “sewing machines” were actually filled with Remington rifles headed for Vladivostok to arm White Guards in the Russian Civil War. With direct backing from “expeditionary” forces sent by the U.S., Britain and other capitalist powers, the counterrevolutionary army sought to strangle the new Soviet republic of Lenin and Trotsky. 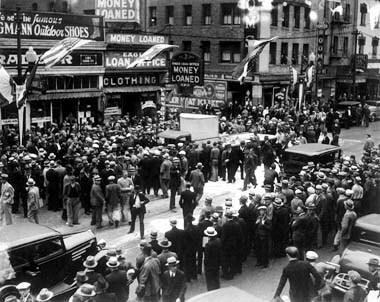 Longshoremen in Seattle and San Francisco refused to load the shipment; scabs recruited to replace them got a well-deserved thrashing instead. The ships were eventually loaded, but by the time they reached the Russian Pacific port of Vladivostok it was in the hands of the Red Army, and the arms ironically aided the workers revolution. Union “leaders” who go along with government attempts to intimidate the ranks, who help the capitalists set one group of workers against another, who keep unionists working after contracts expire so as to avoid “disrupting” profits – these labor fakers chain the workers’ enormous potential power. Unchaining this power and wielding it in defense of the vital interests of labor and all the oppressed, on an international scale, is the task of a leadership committed to doing away with the capitalist system of exploitation, racism and war. A real fight by West Coast longshore workers could evoke widespread support from workers everywhere – including dockers around the world – and serve as a rallying point for the struggle against the repressive onslaught pushed by the war-crazed ruling class. Longshoremen: strike to win! Down with the Maritime Security Act, mobilize labor and the oppressed against government strikebreaking! Not flag-waving class collaboration but internationalist class struggle! Break with the Democrats, dump the sellout bureaucrats – Forge a revolutionary workers party!